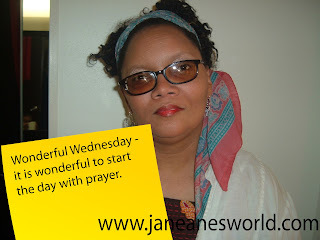 Wonderful Wednesday - it is wonderful to start the day with prayer. I am a Christian wife and mother so for me, the idea of starting the day with prayer makes sense. Prayer is defined in many ways, according to Dictionary.com, for example, prayer is a devote petition to God or an object of worship. I have my own definition of prayer. For me, prayer is a conversation with God. Each morning, my best days start with me reading my Bible and talking with God about things. Sometimes my conversations are audible and sometimes they are mental only. When I am able to sit in bed and talk with God, my days seem to go better. Each day I start with prayer goes a little different. Sometimes the conversations are about whatever it is I read in the Bible that morning. I try to figure out what is in the Bible passage that I need to learn. Other times, I talk with God about things going on in my life. As a wife, mother and business owner, there is always something to talk to God about, something I need advice about. I like these words because they say that even if Christian faith is in vain and there is no God, life has been better living with belief than without out it. In other words, even if my faith has been in vain and there was no God, the belief, the faith the ability to start each morning with prayer, have made life worth living to me. I have been able to live a life with the knowledge that comfort is available. My faith in God, my belief in His power and that all things work together for good for those who love the Lord and are called according to his purpose makes my life better and makes me feel there is a better thing, a good result that I will achieve. So, by starting each day with prayer, an exercise of faith, makes life worth living for me. Getting up in the morning with a prayer, a reminder of where my faith lays and where my strength and help come from helps make my Wednesday Wonderful So the question for you this wonderful Wednesday is have you ever considered starting your day with prayer? Add a link to your favorite article about prayer. I am a superhero, also known as a mom. Loving my kids is my super power. I am the President and Chief Executive Officer of James, Davis and Associates, a private consulting firm that was created to serve as a strategic planning resource to help businesses grow and thrive in the modern marketplace. janeanesworld.com to schedule a consultation. Some of the images used here were found through google, photobucket or other internet public location. I don't claim credit for these images except as explicitly stated. If you wish to receive credit or to have them removed because they are your intellectual property please let me know I will gladly do so. Thank you for visiting Janeane's World. If you like what you see, please feel free to share, but keep in mind this content is copyrighted, so please give credit when using this intellectual property. Thanks! Copyright: Janeane Davis 2012. Simple theme. Theme images by molotovcoketail. Powered by Blogger.